America's relationship with China? It's complicated. And in the wake of Donald Trump's surprise victory, relations between the two economic superpowers could be about to get even more so. Earlier this year, the Pew Research Center explored Chinese attitudes towards the US, globalization and China's increasing role in global affairs – with interesting results. The survey found 75% of respondents believe that China plays a more important role in the world today than it did 10 years ago. Americans, on the other hand, are pessimistic about their country’s global influence. 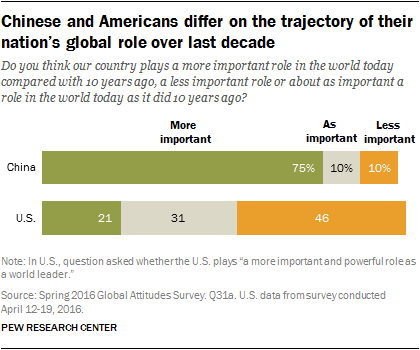 Almost half (46%) believe the US plays a less important role in the world than it did a decade ago. Only around one in five thinks their country has become more important. The Chinese are also more optimistic about their country’s involvement in the global economy: 60% think this is a good thing, compared with only 44% of Americans. The Chinese are wary of outsiders, the survey found, with more than three-quarters believing their way of life needs to be protected against foreign influence. On relations with the US, over half believe the country is trying to prevent China from becoming more powerful. There is also concern that US power and influence poses a major threat to China. At the same time, half have a favourable view of the US, and just over half (52%) have confidence in President Barack Obama. But, as the chart below shows, Chinese views of the US have swung back and forth a lot over the past decade.